SFXis a British magazine covering the interesting topics on science fiction and fantasy. It is a monthly magazine and was started in 1995. SFX is the world's leading sci-fi, horror and fantasy magazine. 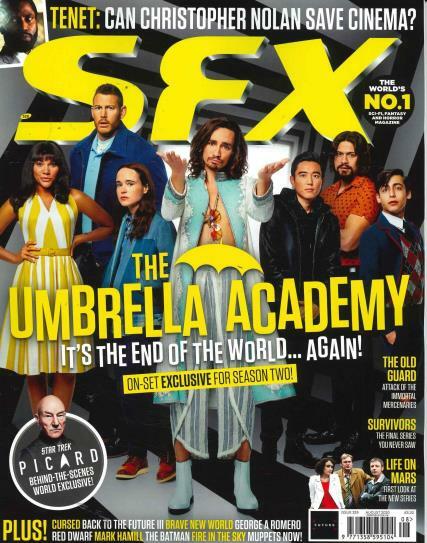 Covering all areas of the genre across TV, movies, books, games, collectables and comics, every month SFX delivers news, features, exclusive Q&As, behind-the-scenes stories, star profiles and TV episode guides. Recently redesigned to reflect the growing mainstream popularity of sci-fi, now you can read our Hollywood news, TV celebrity interviews and top columnists. The magazine contains articles on intriguing topics in the genres of popular science fiction, fantasy, horror, and comics shown or published in films, television, videogames, and literature that is novels. According to the publishers, “SF”, stands for Science Fiction, and “X” stands for everything else. The current editor of this magazine happens to be David Bradley, who shares immense passion for science fiction and fantasy, which is quite evident in his articles. A special aspect of the magazine is that it publishes regular special editions, which are known as “SFX Collections”. The magazine also has been hosting annual conventions for its readers and enthusiasts alike, known as the "SFX Weekender" since 2010. This magazine provides a great monthly overview of what is happening in the sci-fi world. It provides sci-fi reviews that covers films, tv, comics and books. You are presented with the gossip on forthcoming TV imports/cancellations. The rants and raves by the magazine contributors and editor always make me chuckle. They certainly convey their love for sci-fi. I would love to sit in on some of their editorial meetings – I can guarantee that mine are very dull in comparison. The letters page is always interesting. The magazine provides positive and negative letters on the same subject – which ensures that there is not a biased view. On each article, they indicate if they are going to reveal any plot secrets - which I find a nice touch. Finally I like reading the interviews with actors, directors and authors. All in all, i think this is a good all round sci-fi magazine that will “live long and prosper”.